Well I haven't heard yet that Jun Suzuki has lost his job, or even worse had the Chairman's vote of confidence. However the man must be surely watching his back round the corridors of power at the Nack5. All the pre-season optimism and early season form has rapidly dissipated and we are left with a team that is lacking any confidence and if Cerezo had been a better team they would have walked away with not only 3 points but a far bigger victory. Ardija offered very little in this game if anything at all in front of their own despairing fans, and in the next few games Suzuki's first job is to stop the rot. What better place to start than the Nissan Stadium and the struggling F Marinos. In fact we are a point ahead of them. Thus far the FM's have drawn 3 games and lost 2 so a draw looks a likely result then. Despite the fact that the Nissan Stadium held the World Cup Final in 2002 it is a joyless affair for me, a huge soulless bowl of a ground with the dreaded running track, and at a capacity of about 80,000 fans is almost never full for J League games and certainly won't be when we turn up (I don't know if it's being played in the smaller Mitsuzawa stadium). Yet, I think that this gives us a chance to make use of a lack of atmosphere and with Yokohama's manager currently not winning any popularity competitions among the F Marino fans, and pile more pressure on that team by getting something out of the game, even a win. Of course, F Marino fans will likely be thinking much the same at the prospect of our visit coming on the back of conceding 7 goals in our last two games. As I wrote in my previous post, our desperate position stems from a real lack of goals, and a shaky defence which can't hold out for 90 minutes. Can Suzuki turn it around with the players he has to choose from? Let's start on Saturday 14th April away to Yokohama F Marinos at 2pm. 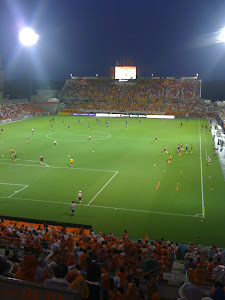 Let's go Omiya!